James Wright is President Emeritus and Eleazar Wheelock Professor of History at Dartmouth College. The 16th President in the Wheelock Succession, he served as president from 1998 until June 2009. A member of the Dartmouth faculty since 1969, Wright also served as Dean of the Faculty from 1989-97 and as Acting President of the College during the first six months of 1995, while President James O. Freedman was on sabbatical. 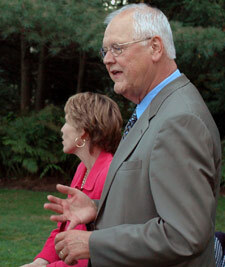 He served as Provost from 1997-98 and was elected president in April, 1998. As president, Wright’s priorities included advancing the academic strength of the institution and expanding the faculty, enhancing the out-of-the-classroom experience, strengthening Dartmouth’s historic commitment to a strong and inclusive sense of community, building and renovating Dartmouth’s facilities and strengthening the College’s financial resources. He worked to more fully integrate the professional schools into the intellectual life of the College. During his presidency undergraduate applications grew by 79 percent and the student body became increasingly diverse, with students of color and international students representing more than 40 percent of the student body. The College also made significant improvements to the financial aid program, including: tripling the budget for undergraduate aid, expanding its need-blind admissions policies to include international students, eliminating loans for all students and offering free tuition to students who come from families with incomes at or below $75,000. President Wright focused on advancing the academic strength of the College by expanding and diversifying the faculty; resulting in more than 10 percent growth in the faculty of the Arts & Sciences, an 8:1 student-faculty ratio, and the highest percentage of tenured women faculty in the Ivy League and among the highest percentage of faculty of color. The three professional schools all participated in similar patterns of growth and improvement. Leading the College’s $1.3 billion campaign - the largest fund-raising effort in its history - Wright provided additional resources for faculty support, including: the creation of more than 20 new endowed professorships, increased compensation and research funding, and the construction of Berry and Rauner Special Collections Libraries, Carson Hall, Moore Hall, Kemeny Hall, and the Haldeman Center. Wright enhanced the out-of-classroom experience by investing in new residence halls and off-campus housing for students, renovating or building new athletic and recreation facilities, and subsidizing student tickets to the Hopkins Center and athletic events. Under his stewardship, the College’s endowment and annual fundraising more than doubled, with more than 67 percent of all alumni/ae making gifts to the Campaign for the Dartmouth Experience. In 2005, Wright began a series of visits to U.S. military medical facilities in Washington, D.C., where he met Marines and other U.S. military personnel who had been wounded in the course of service in Iraq and Afghanistan. (He had himself enlisted in the Marine Corps for three years when he was seventeen years old. He was discharged at the rank of Lance-Corporal.) In over two dozen visits since then, he encouraged the injured servicemen and women to continue their education, and he subsequently joined in establishing and assumed responsibility for raising funds to support an educational counseling program for wounded U.S. veterans, Severely Injured Military Veterans: Fulfilling their Dreams, offered through the American Council on Education (ACE). President Wright worked with Senators Jim Webb, John Warner, and Chuck Hagel on language for the GI Bill that was passed by Congress and signed by President Bush in June 2008. His interest, successfully met, was to provide a means for private institutions to partner with Veterans Affairs in supporting veterans who matriculated at these institutions (the "Yellow Ribbon Program"). Since he stepped down from the Dartmouth presidency in 2009, Wright has focused on support of veterans and research, writing, and public speaking on matters relating to education and veterans. In his 44th year at Dartmouth, he taught a senior seminar on America's wars in the winter term of 2013 and again in 2014. Over the last few years, he has written articles that have appeared in online publications, the New York Times, Foreign Affairs, The Atlantic, and the Huffington Post. The theme that runs through all of these is the way in which American society largely ignores those who fight and sacrifice in the country's wars. Wright's most recent book, Enduring Vietnam: An American Generation and Its War, released by Thomas Dunne Books/St. Martin's Press in April 2017, provides a rich account of an American war and the Americans who served there, and the enduring impact of the Vietnam experience. In Those Who Have Borne the Battle: A History of America's Wars and Those Who Fought Them, released in April 2012, he provides a historical overview of American views of wars and those who have fought them, from the American Revolution to the current wars, and shares some of his own experiences and insights. In May 2007, The New York Times presented a feature on Wright's work with injured veterans, and "ABC World News with Charles Gibson" featured Wright as its Person of the Week. The New England Council recognized him as the New Englander of the Year, and he received the Council of College and Military Educators “President’s Award” in February 2008. He was honored in April 2008 by the Marine Corps Scholarship Foundation, which conferred upon him its Semper Fidelis Award in recognition of his efforts to ensure educational opportunities for wounded veterans. In March 2009 President Wright received a commendation for his work from General James Conway, the Commandant of the Marine Corps. In June 2009 the Boston Red Sox recognized his contributions to education and to supporting veterans by inviting him to throw out the “first pitch” at a Red Sox game. In August of 2009 at the annual convention of the Veterans of Foreign Wars Wright received the Commander-in-Chief’s Gold Medal of Merit Award and Citation. In March of 2010 the New England Board of Higher Education recognized him with the Eleanor M. McMahon Award for Lifetime Achievement. He received the Secretary of the Army Public Service Award in February 2017. James Wright received a bachelor's degree from Wisconsin State University-Platteville and a masters and doctoral degree in history from the University of Wisconsin at Madison. An American historian, his teaching and research focused on American political history and the history of the American West. Earlier books that he has authored or edited are: The Galena Lead District: Federal Policy and Practices, 1824-1847 (1966); The West of the American People (1970); The Politics of Populism: Dissent in Colorado (1974); The Great Plains Experience: Readings in the History of a Region (1978); and The Progressive Yankees: Republican Reformers in New Hampshire (1987). He received a Social Science Research Council Grant, a Guggenheim Fellowship, and a Charles Warren Fellowship at Harvard. James Wright has been elected to the American Academy of Arts and Sciences, and he is a member of the Organization of American Historians, and the Western History Association. He serves on the board of the Semper Fi Fund. President Emeritus Wright is married to Susan DeBevoise Wright, who served in various roles at Dartmouth from 1978 until 2009. He has a daughter, two sons, and seven grandchildren. Both James and Susan Wright were awarded Honorary Doctorates by Dartmouth at Commencement in June 2009.